Home > Fireplaces > Zero Clearance Fireplaces > Empire Breckenridge VFD32FB0L Deluxe Vent-Free Louvered Gas Firebox - 32"
* Please Note: This item is a vent free appliance and installation of it may be prohibited in your jurisdiction. Customers are responsible for checking local codes and regulations prior to purchase. *Also Note: Brick liner, as shown in image, is not included with this unit. This beautiful louvered firebox will help you to create a lovely, inviting fire, and its installation is easy because absolutely no vents are required. 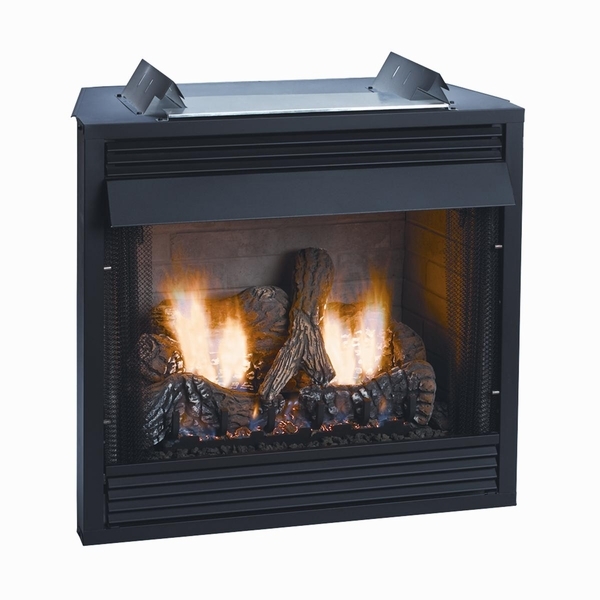 The deluxe 32" firebox accepts most 18" vent free gas logs (purchased separately). The unit is light and is made with hem-bent seams that make unreliable screws and fasteners unnecessary. A matte black hood is included. The dimensions of the required framing are 36 1/8" H x 35" W x 17" D and the unit's actual dimensions are 35 5/8" H x 34.5" W x 17 7/16" D. There is a 5-year limited warranty. Is this unit made in the USA? This is indeed made in the USA. This is a firebox only, so as long as you are installing a propane gas log set inside the box, propane is approved. Does this require a liner? This unit does not require a liner. Can this fireplace be vented? I am reading that the vent-less units put out a lot of moisture in the room. No. 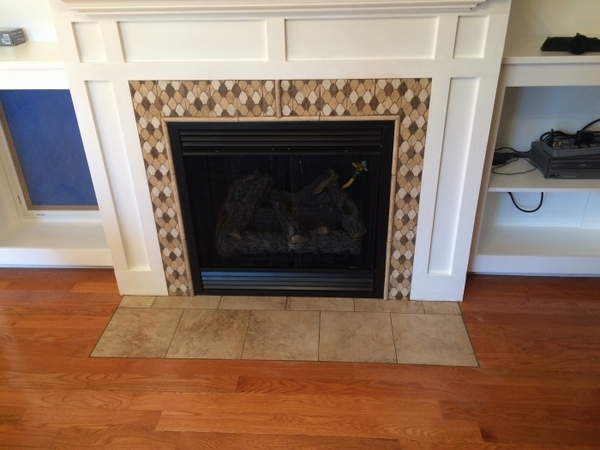 A ventless fireplace or firebox cannot be converted into a vented one. Will this work at 6,000 foot elevation? Is this product compatible with propane? This is strictly a firebox, so compatibility with propane will depend on the log set you purchase for the box. Can you add a pair of operable screen doors to this unit? You may absolutely add a set of operable doors to this firebox. Does this come with a glass front? No it is a vent free firebox so no glass front is made for that unit. Will this unit work outdoors on a concrete covered patio area??? No, this is not an outdoor-rated firebox. Which blowers are compatible with this unit? The FBB 5 blower is the correct fan for that unit. Is the thermostat built into the unit? No there is not a built in thermostat. Could this be used with ethanol canisters with respective logs? If there are no combustible materials inside the framing, can the "ears" on top of the firebox removed to accommodate a shorter height of the rough opening? The standoff "ears" should not be removed from the top of this unit. Can this be vented outside? This unit is not able to be converted over to a vented unit. What are the actual firebox dimensions? The unit's overall dimensions are 35 5/8" H x 34.5" W x 17 7/16" D.
Can this fireplace be mounted in a wall with a 55" TV above it (without damaging the TV)? 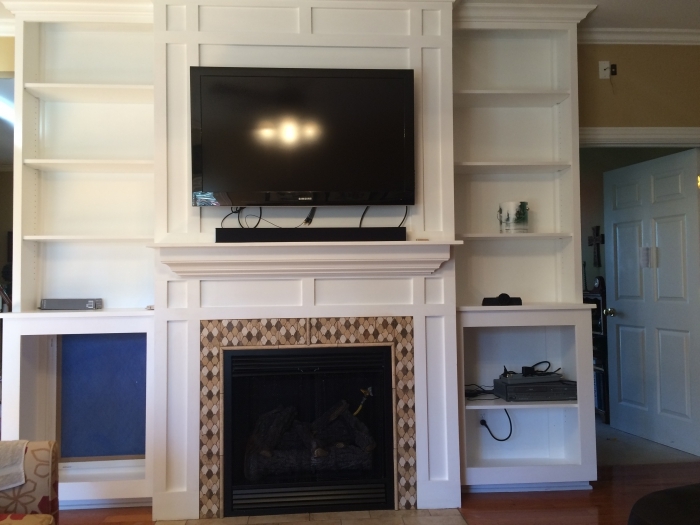 For this type of installation, I strongly suggest installation of a mantel that is at least as deep as the television to protect it. Vent free fireplaces release a large amount of heat to the area directly above them and they are prone to damaging sensitive electronics without a mantel or shelf of some sort. Will the 18" Empire ventless logs (Stacked Oak, Charred Oak, or Whiskey River log styles) fit in this unit? This box will fit any vent less log set that requires a 28" middle width or less without the addition of brick panels. 26.5" with the addition. The middle width and depth requirements will be listed on the product page for the log sets. The dimensions of this fire box are 31" FW x 25 3/16" BW x 14 1/8" D without panels and 29 5/16" FW x 24" BW x 13 5/16" D with panels. Can this Empire Breckenridge VFD32FBOL Deluxe vent-free louvered gas firebox be used with an oak surround? It can indeed, just as long as the minimum side and overhead clearances are maintained. These clearances are outlined in the owners manual. This product weighs 110 pounds. What does the inside of this firebox look like without upgrading? The interior of this firebox will have a flat black finish if you choose not to order any of the optional liner kits. Does this firebox include a brick liner? This particular version of the box does not include a liner as standard. There are accessory liners that can be added to the standard box from its item page. What is the heating area this unit can heat up? This item is a vent-free firebox only and does not include a burner or logs. A ventless log set will need to be purchased separately, and the heated area will depend on the BTU rating of that set. Can this model be installed into a wall? This unit can certainly be recessed into a wall. Just a simple durable firebox. This worked out great. No problems or issues at all. The right size for the location. Well built. ConsCould provide an optional unit with same depth 16 1/4" & height 33 3/4" but wider up to 36". Everything went smoothly with the install. Heats well. The fireplace we ordered came in on time and fits great. This was as easy as could be. Great competitive price. Fast shipping. Excellent communication from efireplacestore.com. Installation was super easy. Insert looks great and warm. Just in time for the Holidays. ProsLooks good. Easy installation. Great price. I just put this ventless fireplace in. It was very easy to install. The folks at efireplace.com were very helpful. ProsLooks great and works great. Easy to work with, shipped fast! See image below. This is what we did with them. Looks great! We built a fireplace in an open area with high ceilings and with this firebox all the entire area keeps warm and cozy. Firebox construction is very heat-resistant and safe. Fantastic deal for my distant master bed room. A person with some carpentry skills can put this heater (gas log included) in a weekend. The price is right on. I recently ordered a Breckenridge firebox, it was delivered promptly (within 4 days of my order), This allowed me to complete my project ahead of schedule. The unit looks good and is well made.